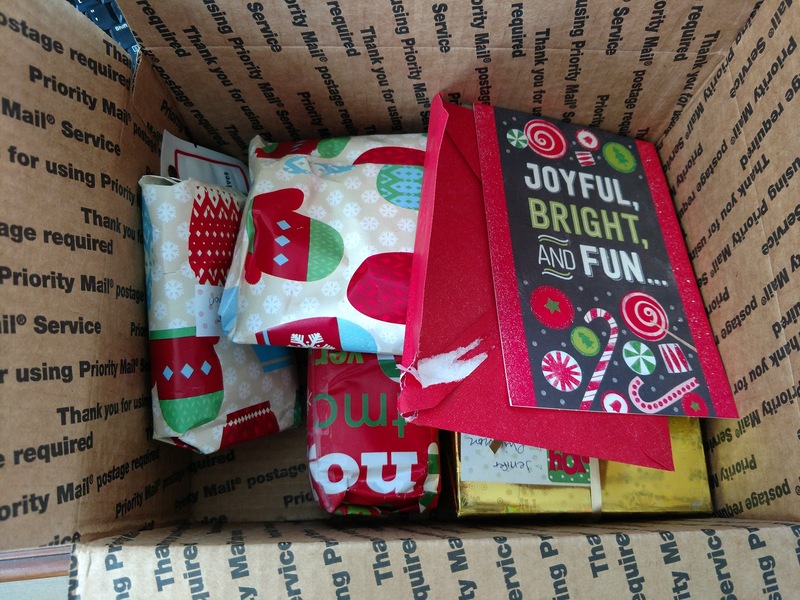 One of the things I've grown to love best about blogging is the community, and the Secret Santa Tracy has hosted every year for the past...four? years totally epitomizes that. I especially love it when Secret Santa leads me to a new blog to read like it did this year! 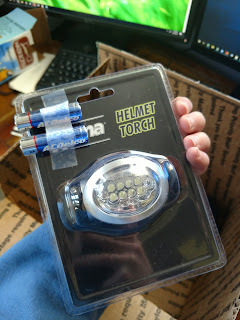 And then I had specifically asked for trailering safety things for Christmas in general, so I was happy to find some magnetic and hookable LED lights and a helmet headlamp - both of which she remembered to put batteries in! Since I use my trailer for year-round storage of things I don't use often, there are times when I just want to grab something quickly and don't want to bother with carefully backing my truck up so it's in range of trailer plug just to turn on the built-in lights in the tack room. These are going to be awesome for those situations! And they're SO bright! Thanks so much, Rhiannon! Love it! I'm sitting here like "ooooh cool" about the lights. Horse girls are weird ;) But for real, I need to get some of those! Right? They are my favorite thing. I don't think the magnets will work in my aluminum trailer, but the hooks will be perfect for the gridwall. If I remember correctly, yours has more steel than mine so you may be able to use the magnets if you get some! Those socks are AMAZING and the light looks awesome, too. Haha yeah I love the socks. I actually laughed out loud when I saw them! Aaaaaand I'm off to Amazon to find myself some cool lights for me! I seem to exist only in the dark, and my trailer lights require me to reach up and "click" them on which is hard when you're holding a horse... both of yours seem super handy! Yes, same here! I'm probably going to hook one on my windows for loading too. Really handy lights! Very thoughtful and those socks ROCK! Thank you so much for participating this year and happy holidays! Thank YOU for hosting! That is not a small amount of work! 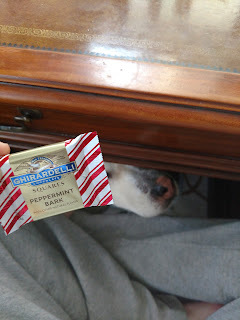 Mmm I love the ghiradelli peppermint bark. Me too! 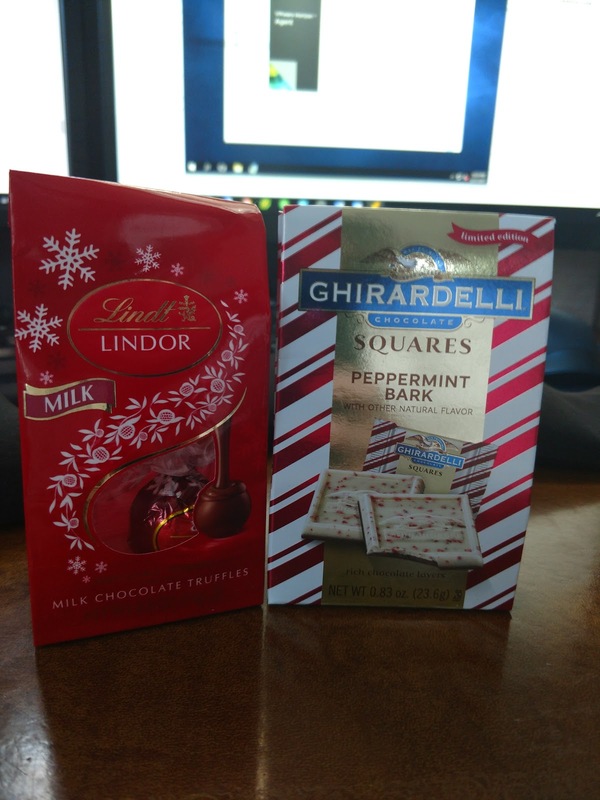 I am not a huge chocolate person, but I like that stuff. I ate it so fast it is a little embarrassing to admit in public, lol. Love those LED lights and love when folks give us new ways to make life easier!! Lol! You are my purple friend! You should see my house, it's my most frequent decorating color. So glad you love everything! I have to admit that when I tried the magnetic lights out, I nearly blinded myself. Those suckers are bright! 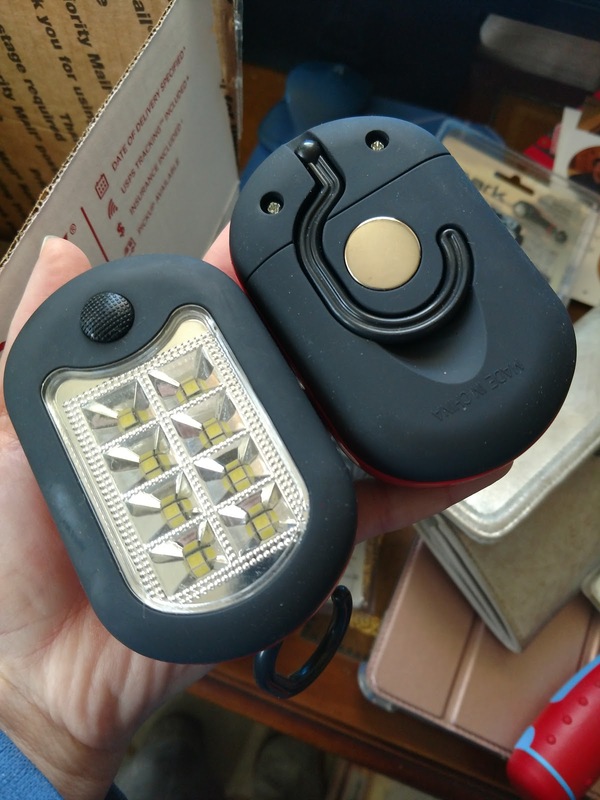 I will take credit for the batteries on the headlamp (thanks husband who always has a ton of AA batteries), but I was surprised to find the other lights actually came with them. 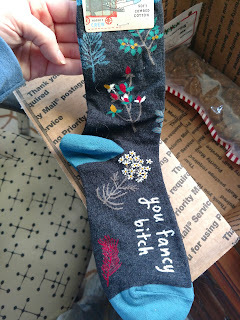 I always hesitate to buy socks with cuss words on them for people I don't know well, so I'm glad you like those too. 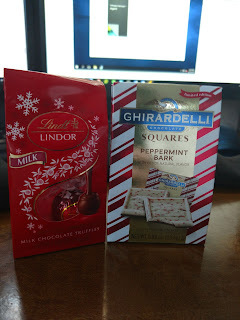 The truffles and the peppermint bark are some of my favorites too. I'm also pretty sure if Dexter knew about the Mrs. Pastures, he would have been extremely jealous. I'm glad Connor enjoyed them! Haha, I also blinded myself when I turned them on! They are SO bright. Really looking forward to it being a normal temperature outside so I can try them out. I am very much a cuss word person so no worries there :) Thank you so much for everything, it was great! Those lights are awesome!! 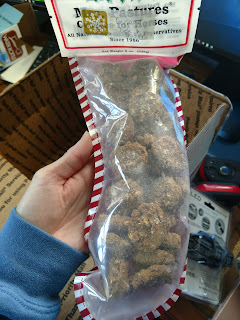 I have had a few for when I had to do night feedings and the barn didn't have electricity.